We were learning the lake and how to maneuver around on it. That is really important and eliminates wasted time fishing waters and areas that do not hold fish. That information comes from the local bait shops. 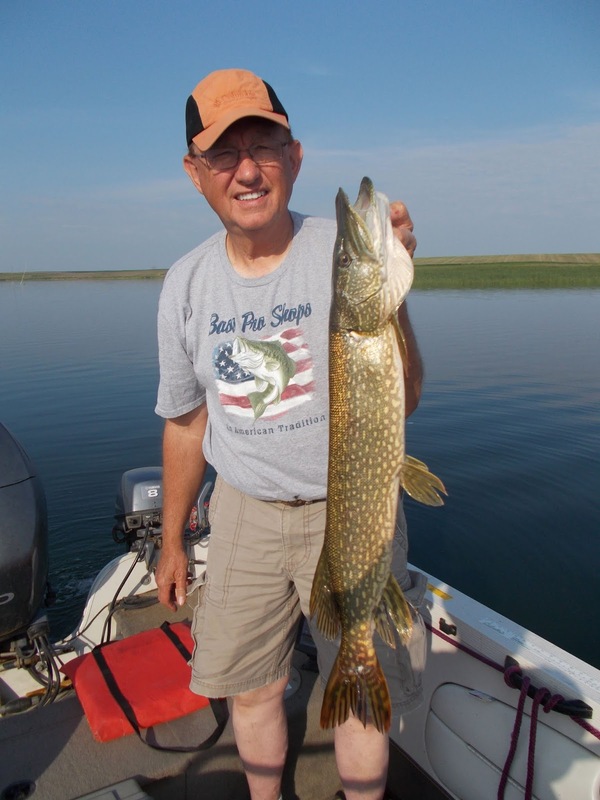 We stopped at the bait shop in Valentine the evening before and visited with the owner. He said stop back in the morning before you go to the lake as he had a friend that fishes the lake almost every day and comes in for coffee, rolls, and to shoot the bull. We noticed that the locals live at a really nice pace and do a lot bull shooting. They visit a lot talking about not much of anything. This is known as shooting the bull or bull shooting depending on the circle you are in. Fisherman: This is the lure to use. It has rarely let me down. Click on the link or the pic and buy from Bass Pro. Available in different colors. We were at the bait shop by 07:30 a.m. even though it opened up at 8:00. The door was open and we went in. The owner remembered us and sure enough there was the local fisherman drinking coffee, eating a roll, and you could tell these two gentleman were shooting the bull. Wow, he was a fantastic source of information about the lake. The previous week the fishing had been slow, but he was expecting a big pick up as a high pressure was to prevail. All the weather had moved to the east. He had poor luck the day before and gave us some good recommendations. After pulling out of the boat ramp, we stayed to the right and headed to the face of the dam. We were told to fish the dam face in the corner of the shore line and move back up the shore at least 200 yards to a boat dock in the water. He said to stay in 5 to 10 feet of water. He also stated that pulling spinners was okay, but if the wind was light he wanted us to use a slip bobber and float with the current in about 5 feet of water. We worked the corner and up the shore line, but had no luck. Looking straight towards the dam after coming out of the boat ramp. Fish to the right and up the shoreline. The second spot was to the entrance of the long arm just off the dam. Staying to the left side of the arm, the water moves into about 5 to 10 feet of depth. We were to stay in that area as it has been productive on a regular basis. We scored nothing at this location. Next, we moved along the shore down the lake to a point where three pieces of timber stood. Again we stayed in 5 to 10 feet of water. We changed colors of spinners. Pam pulled a red one and I pulled a shiny one. We were thinking that maybe we just didn’t have the right color. We stayed with leeches as the local fisherman said not to move off the leeches. We did not have any action at this location. Just off the left side of the entrance into the long arm is a group of small islands. We fished those. Now, what was happening with the weather was not good. We were to have overcast to broken clouds and there was not a cloud in the sky. Also, there was to be westerly flow of 5 to 10 mph but there was hardly any wind at all. In fact the lake in most areas was dead calm. This is not good walleye weather, and we had been well toasted yesterday even with sunscreen. 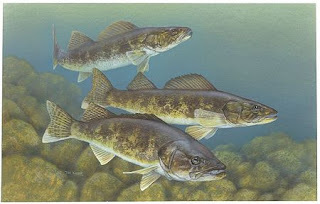 There was an awful lot of light penetrating into the water and the walleye will not hang out in a high light situation. We started to fish a little deeper, but the lake really drops off into very deep water once you move from the shore. It was common to see a drop right down to 30 feet and deeper as you moved out. We have the equipment to fish that, but the feeling was it might be premature. Across to the opposite shore was a point sticking out surrounded by a good stand of weeds out into the water. That looked like good northern pike water and we motored over to give it a try by working the weed lines pulling the spinners. If there was a northern lurking along the weed line, it did not come out and hit on our baits. Musky are also in this lake, but in all the years I have fished northern waters or waters with musky, I have never had the good fortune to catch one. The weeds are next to the shoreline, and we worked back and forth, but no luck. With the temps rising and the lack of wind, this day was well on the way to giving us a skunking. Decades ago when my son was young, we fished on Lac Lacroix in Ontario with a good friend from northern Minnesota. The lake is in the northern part of the BWCA. (Boundary Waters Canoe America). On days like this one, he would not fish, but went to the tent, read, and generally relaxed. He loved it when the weather was windy with a good overcast making it a dark day. We caught a lot of fish in that kind of weather. There are no fish here. However, look at the beautiful lilac bush along the shoreline. This particular area was full of these beautiful bushes. Not giving up, we shifted gears considering that the fish may be a little deeper. This was an opportunity to use my true and well tested method of pulling plugs. The plug is the Berkley Flicker Shad. It is a sinking lure that has a steady wobble and a little rattle. A close friend and old walleye killer said this lure made the fish mad. That was what we wanted, a mad walleye smacking the daylights out of the lure. I might also add, when using this bait, have a good set of pliers on board with a wire cutter. My wife said this lure should be called “finger shad” because those little hooks are really sharp. On two occasions I have had to push the hook through and clip it off after I got it into my finger. With a little neosporin and a band aid, you can continue fishing. Back to the dam we went and started pulling plugs in 10 to 15 feet of water. We did not have one hit. This is the first time I have ever had this happen with this plug. It was time to find Hidden Lake on Merritt Reservoir. This was the last location the local fisherman told us to hit. He said it was full of Northern Pike and there would also be some walleye if the pike had not cleaned them all out. Refer on your map to the Powder Horn Area on the north side of the lake just to the left of the dam. There is an unimproved boat ramp there and opposite is an arm off the lake. Getting into it is a little daunting as all of a sudden the bottom comes up to about three feet of water. Motor slowly for about five yards and it goes back down and opens up into a long narrow channel. I would recommend stopping at the bait shop in Valentine and getting their free map. The entrance to hidden lake. The bait shop in town will give you directions to this arm off the lake. The waters really looked good. Once in, we worked our spinners and plugs along each side of the arm all the way down to the end of the arm. This was great looking water with plenty of standing weeds and timber with logs into the water. It was a really fine opportunity to catch a nice fish and also get snagged. At the end of the lake we followed the recommendation and dropped a single small jig with a leech and hooked up a bobber. We were in about 5 feet of water and the bait was down about 3.5 feet. At this location there was no wind and we just drifted slowly to the shore. The shoreline goes from timber along the side to open banks and underground weeds. This was a really rough day. We were running out of time and we were being cooked off the lake. We went back to the Flicker Shad and slowly working our way out of the finger. We each had some luck. 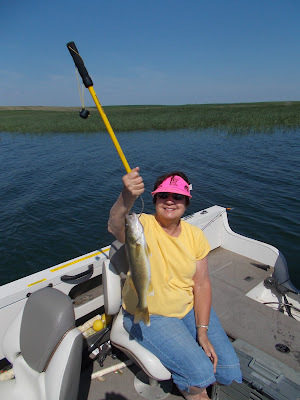 Pam hit a keeper walleye and we were in business. Not bad and it is a legal fish. Pam caught another one on a Flicker Shad or Finger Shad as she like to call the lure. We continued to work the bank moving out toward the middle of the lake arm, but always staying in 10 to 15 feet of water. I was skunked up to this point until I had the good fortune of picking up a keeper Northern Pike. He will fillet out and once the Y bones are removed make some great fillets. Not a big northern, but one we can get some excellent eating out of once the Y bones are removed. Mix the almond meal with a little panko and the salt and pepper. Place fish fillet in egg wash then roll in almond meal/panko mixture. Melt 2 tablespoons butter and 2 tablespoons canola oil in a pan over medium low heat, then add fish and sauté about 4 minutes per side (depending on thickness). Remove the fish to paper towels, turn heat to medium high and add the sliced fruit. Stir and fry for a minute then add 2 tablespoons butter to sauce and cook until butter browns. Add wine & reduce. Place fish fillet on plate surrounded by fruit and drizzled with sauce. Drink the wine and if available have yourself a couple of bottles of Tusker Beer. Makes 2 servings.